Yesterday, the Riga City Council banned beggars from Riga's historical center. Outside downtown Riga, begging will only be allowed with personal IDs. 51 deputies voted in favor of the motion, five abstained, reports LETA. Obtrusive begging will be forbidden on the streets of Riga. 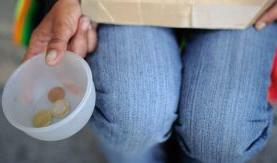 Beggars will not be allowed to use animals to seek compassion among city residents and guests. Begging will be banned in public transportation, on city roads, sidewalks, stairs, overpasses, squares and other areas, where it could hamper pedestrian movement.